When Should You Take Your Small Business to the Next Level? If things are going smoothly with your small business, you may be tempted to start increasing the stakes—possibly expanding into another location, investing in more staff, or branching out into related products or services. But how do you know when the time is right? After all, every small business follows a different road map. Luckily, there are some general guidelines for determining when your company might be ready to expand. Enter your information via our quick form to immediately receive your complimentary copy of this must-have Community Futures e-book! Community Futures Manitoba is committed to helping you market your small business, whether it’s an ecommerce company or brick-and-mortar store, so you can be a successful entrepreneur. Find the nearest regional office at www.cfmanitoba.ca and get the support you need to build your small business today. Download "Hit or Stay? 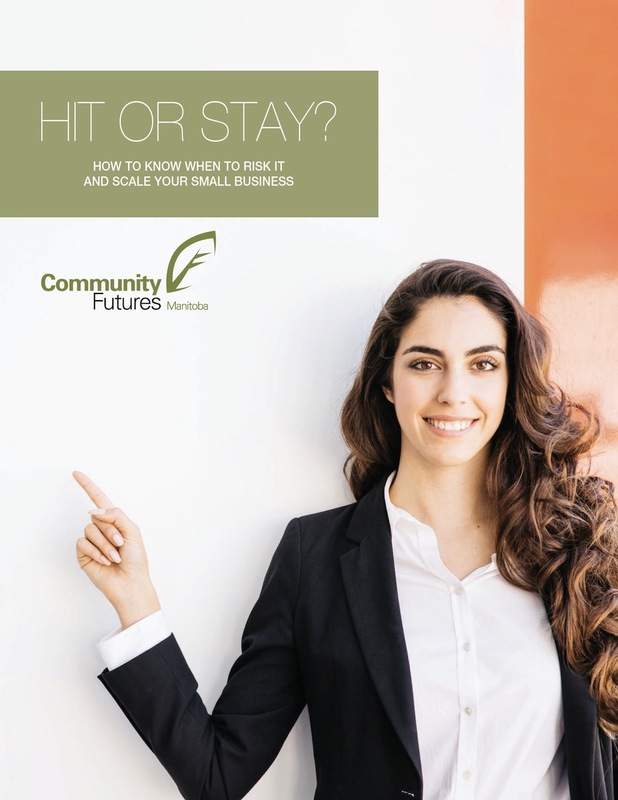 How to Know When to Risk It and Scale Your Small Business"
- Please Select - Ashern (CF West Interlake)Brandon (CF Westman)DOTC Communities (Dakota Ojibway)Elie (CF White Horse Plains)Flin Flon (CF Greenstone)Grandview (CF Parkland)Lac du Bonnet (CF Winnipeg River)Lynn Lake (CF Northwest)Morris (CF Triple R)Northeastern Manitoba; e.g. Island Lakes (CF Kitayan)Portage la Prairie (CF Heartland)The Pas (CF Cedar Lake)Riverton (CF East Interlake)Selkirk (CF North Red)Southeast Tribal Council Communities (CF Southeast)Thompson (CF North Central) Please select your nearest town. - Please Select - Not Interested in a BusinessThinking of a BusinessReady to Start a BusinessWant to Grow My BusinessI Would Like Community Futures to Contact Me ASAP Please select a stage. We will never provide your email address to any 3rd party - Your information is confidential.